The hottest known planet in our galaxy is being stretched into the shape of a football and rapidly consumed by its parent star, new observations from the Hubble Space Telescope show. The planet's parent star, WASP-12, is a yellow dwarf star located approximately 600 light-years away in the winter constellation Auriga. 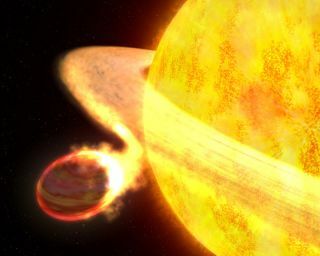 The exoplanet it is slowly destroying was discovered by the United Kingdom's Wide Area Search for Planets (WASP) in 2008. The unprecedented ultraviolet (UV) sensitivity of COS enabled measurements of the dimming of the parent star's light as the planet passed in front of the star. These UV spectral observations showed that absorption lines from aluminum, tin, manganese, among other elements, became more pronounced as the planet transited the star, meaning that these elements exist in the planet's atmosphere as well as in the star. The fact the COS could detect these features on a planet offers strong evidence that the planet's atmosphere is greatly extended because it is so hot, researchers said. The new observations of WASP-12b are detailed in the May 10 issue of The Astrophysical Journal Letters.